I have always had a kind of soft spot in my heart for the "Mission Impossible" movies. In thinking back on it, I'm not even actually sure if I ever watched all of the first one, but I distinctly remember going to see the second one in theaters and just feeling amazed that I was seeing this big, action sequel in the theater. That was back in 2000 when I was thirteen years old, right around the time when I began to realize how much I adored seeing films in all their glory on the big screen. Though MI2 is widely regarded as the worst of the franchise it will always have a special place in my memories as it was in that moment I understood what a summer blockbuster was supposed to be and it made me look forward to event type films. Filling my head with expectations of future theater outings that I couldn't wait to experience. Still, I can admit that in 2006 when J.J. Abrams took ahold of the series and fashioned a stylish third entry in the series I was even more impressed by the progression of the series. I enjoyed the film and was a little disappointed by the lack of box office reception that pointed towards a not so bright future for the series. Here we are though, five years later and with "Mission Impossible: Ghost Protocol" we have what is certainly the most entertaining and involving mission of them all. Director Brad Bird (The Iron Giant, The Incredibles, Ratatouille) has crafted an exciting, intense, and adrenaline fueled fourth film that makes other action films feel distant, phony even. Where we sometimes don't even feel the circumstances of the situations our characters are in on screen, this "Mission" put us right into the middle of it, forcing us to squirm and hope for the best. 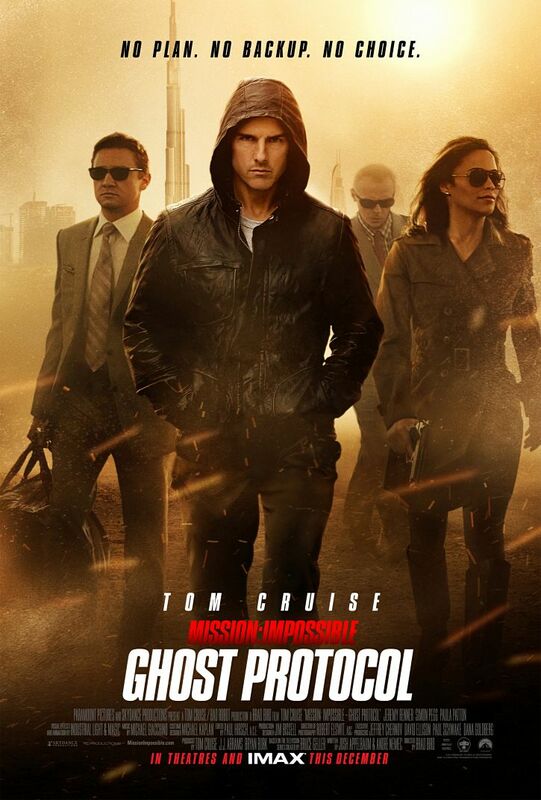 Much like another late entry in a stale franchise from earlier this year, "Ghost Protocol" makes us remember what a real action film feels like. Still, no matter how much I enjoyed "Fast Five" Tom Cruise and his gang take the cake. Hands down. one of the biggest stunts in "Ghost Protocol". And while the elements of suspense and excitement of the action sequences certainly up the anty from the previous installments the story here is also one that strays from the beaten path. This is not simply another mission from the IMF in which Ethan Hunt (Cruise) has to save the day but instead, the IMF agency has been implicated in the terrorist act that bombed the Kremlin. In light of this Ethan and his gang become rogue agents and are set on a mission to clear the name of their agency without any help from it. Ghost protocol is initiated and with that hook of this mission relying solely on the four members of Hunt's squad we are set with a mission that brings us the closest a movie ever has to nuclear war. What helps the story along is that both Cruise and Bird seem to acknowledge this is not a gritty, hero film. That is they tried to take themselves too seriously they would be the only ones not laughing. This is a classic, dazzle and thrill film that is engineered to be a stylish, shiny movie. It is not one that carries a political agenda or is trying to make a huge statement, it is simply for fun and in that regard it goes above and beyond. What else helps the film move along is the supporting cast Bird and Cruise have assembled. It was smart to bring Simon Pegg back as the tech guy from the third one as he and Cruise have a great comic rapport. Having the beautiful Paula Patton as an emotionally damaged agent and the man of the moment Jeremy Renner as a suit with a mysterious past adds to the intrigue of us wanting to accept the mission rather than feeling obligated to. Ethan Hunt has always been a kind of American James Bond and never has that comparison felt more true than with Cruise's portrayal of the government agent here. Not only is his charisma spooling out of every scene, but the energy he brings to the role this time around seems to have inspired some of his best work in years. Though I have always thought of Cruise as more of a screen persona rather than bothering with his personal reputation it had somewhat come into play with roles in films like "Knight and Day" and "Valkyrie" both of which I still enjoyed but felt overshadowed by his celebrity. Skies are as clear as a summer day here though as you feel literally stuck to the edge of your seat for the full two hours. Whether it be the opening prison escape in which Bird deadpans with just the right amount of humor and wit while executing a break out that really gets the ball rolling and puts the audience in the exact mood they need to be to relish every bit of this top notch action flick. Then there is the coolly planned Kremlin infiltration that not only brings out the coolest gadgets this side of MI:III, but it also delivers the series trademark masks. It is a brisk yet rousing attempt to recover launch codes the IMF needs to retrieve after a failed operation that also introduces us to Kurt Hendricks (Michael Nyqvist making his American film debut this weekend also) the real man behind the Kremlin bombing. It is Hendricks who wants to stir WWIII but blackmails the IMF to get them off of his case. Obviosuly this can't be allowed to happen which naturally leads to more death defying situations our protagonists are put into. In what was the highlight of the trailer and is at the center of the movie is the stunt involving the tallest building in the world. When Ethan scales Dubai's Burj Khalifa (and especially if you see it in IMAX) it is a moment of pure insanity. You seem to be watching a man truly test his mortality as he trusts a single piece of technology to hold him to the building. It is one of those sequnces that really makes you wonder how they did that. It is a piece of filmmaking that should be marveled at not only for the risks it seemed to involve but for the spectacle that it achieves. That is what the movies are all about and if films like "Hugo" and "The Artist" are applauded for giving into the nostalgia of the "golden age" of cinema than a film like "Mission Impossible" should be recognized for bringing us face to face with palpable tension. It not only gives the action genre a kick in the pants but it sets a high bar for the entire genre of blockbuster films that are coming out in the summers ahead. to acquire some very important information. 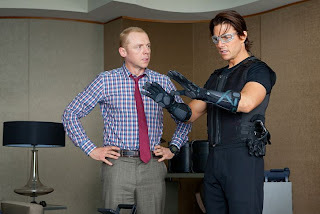 You might read this review thinking I'm crazy, that the whole idea of another "Mission Impossible" movie is nothing if not completely ridiculous, but I dare you to say you didn't have fun or acquire a sense of excitement while watching the film. That is where the secret lies. Director Bird is an expert at making the mundane, the impossible even seem credible. He did it with a childrens movie about a rat; he made a story about old super heroes one of the best animated films of all time and he made you really feel something for an oversized, hollow iron giant. What is to doubt he could not do the same with a Tom Cruise franchise on its last leg? If you still have doubts there is nothing more I can say. The film, in the end, is indeed a credible, expertly crafted, and humorous take on the action adventure genre that has been done to death. It feels fresh, it is invigorating and it includes some of the most breath taking visuals you will have seen on the big screen this year. That is what we go to the movies for: to be swept away. As I sat in my seat experiencing the kind of film that made me feel so inspired as a young teenager I looked over at my fourteen year old brother and could see nothing short of a sense of wonderment on his face. 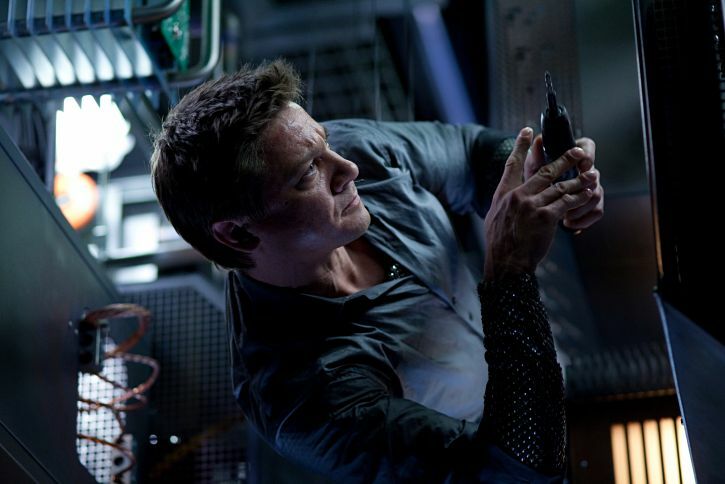 I have no doubt that this mission did the same for him as the earlier missions of Ethan Hunt did for me. I can only hope movies like this will continue to be made with such quality, bringing out the teenager in many people for a long time to come.